The Douglas-Hart Nature Center is located on the northwest corner of Dewitt Avenue and County Road 13. 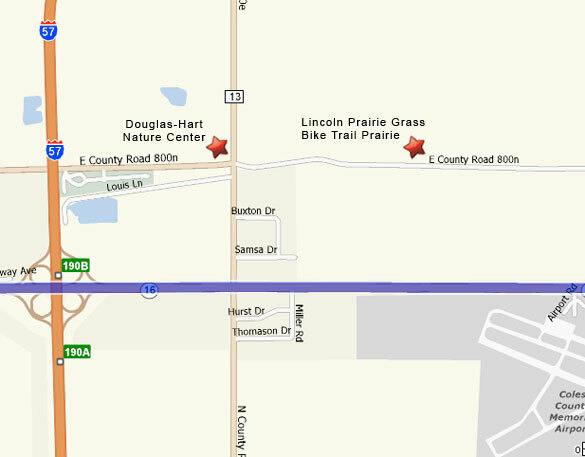 Most workdays held at the Lincoln Prairie Grass Bike Trail Prairie will start off by meeting at the Douglas Hart Nature Center. To get to the bike trail prairie just turn off of the Lerna Road right onto road 800N, and proceed until the bike trail is cut in two by the road. Just after that crossing is a farm lane on the left hand side of the road. That marks the beginning of the bike trail prairie where we manage. From there the prairie proceeds on to the east toward Charleston until you come to the next farm lane.